Trilogy at Wickenburg Ranch by Shea Homes is an active lifestyle community in Wickenburg, Arizona. Situated along an 18-hole championship golf course, Trilogy is a gated neighborhood within the master-planned community of Wickenburg Ranch. Homebuyers enjoy an envious lineup of amenities and a lifestyle catered to their needs and wants. Thoughtfully designed single-family homes are offered in a scenic area with a beautiful backdrop. Though this community has a quiet, rural feel, it's ideally located between Prescott and Phoenix. Wickenburg is a charming city rich with tradition and welcoming residents that sees a generally cooler temperature than most communities in the Phoenix area. An 18-hole championship golf course is located within the Wickenburg Ranch community. Homeowners can obtain discounted rates for one of the most anticipated courses in the area. Wickenburg Ranch Golf and Social Club keeps residents busy all year. The golf facility includes a pro shop and outdoor patio for lounging. 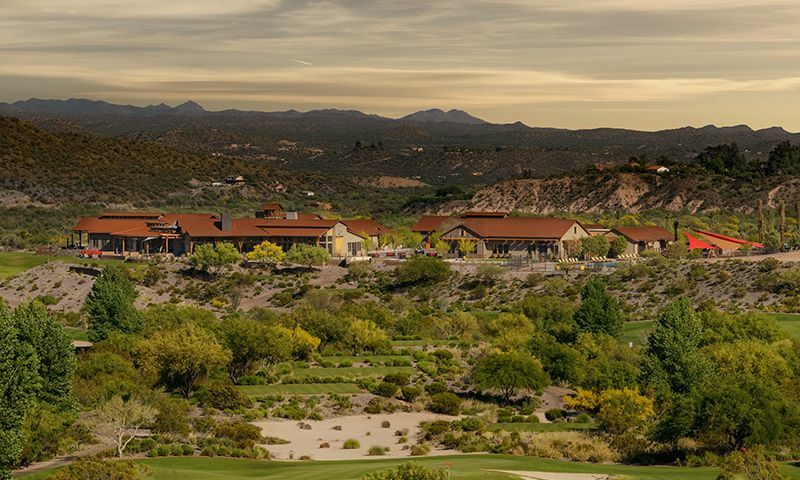 The Wickenburg Ranch Golf and Social Club is an amazing focal point of the community. There you can find a fitness center complete with locker rooms and spa facilities. A special events center and restaurant provide a great location to host special events or attend parties with new neighbors. The amenities continue outdoors with an indoor/outdoor bar, a resort-style pool, as well as tennis and pickleball courts. Enjoying a walk on a cool evening will be a breeze with the trails that wind throughout the community. Shea Homes' Trilogy brand offers thoughtfully designed homes. Trilogy at Wickenburg Ranch's homes incorporate main-level living with modern floor plans and outdoor spaces that take advantage of the area's climate. At completion, about 2,000 single-family homes will make up this community. Homebuyers can select a new construction home from four model series: the Sola Collection, Vista Collection, Ranch Collection, and Sky Collection. The modestly sized Sola Collection includes four models that offer between 1,210 and 1,749 square feet of space. These homes include one to two bedrooms, two or two-and-a-half bathrooms, and attached two-car garages. The Vista Collection includes five models that offer between 1,543 and 2,141 square feet of living space. These homes include two bedrooms, two bathrooms, and an attached two-car garage. The Ranch Collection includes three floor plans that range in size from 2,161 and 2,644 square feet. These homes include two bedrooms, a den, two-and-a-half to three-and-a-half bathrooms, and a three-car garage. The largest homes within Trilogy at Wickenburg Ranch are offered in the Sky Collection. Ranging from 2,914 to 3,124 square feet in size, these three models include three bedrooms, three-and-a-half bathrooms, and a three-car garage. Residents within Triology at Wickenburg Ranch live a carefree lifestyle with like-minded neighbors. Homeowners have access to amazing resort-style amenities for social and physical activities. Playing a round of golf, tennis, or pickleball are ideal activities for fitness-minded folks. Residents are able to create hobby clubs based on common interests and host meetings in the clubhouse. Trilogy at Wickenburg Ranch is ideally situated about an hour south of Prescott and an hour northwest of Phoenix. Wickenburg is a welcoming town that has plenty of parks, cultural activities, and events. Areas for outdoor recreation include Coffinger Park, Sunset Park, Stone Park, Boetto Park, and more. Attend a play at Del E. Webb Center for the Performing Arts, view Southwestern art at Desert Caballeros Western Museum, or attend a traditional Western rodeo. Homeowners in Central Arizona love all that Trilogy at Wickenburg Ranch has to offer. There are plenty of activities available in Trilogy® at Wickenburg Ranch. Here is a sample of some of the clubs, activities and classes offered here. The seven models in the Vista Collection offer between 1,543 and 2,141 square feet of living space. These homes include two or three bedrooms, two or two-and-a-half bathrooms, and an attached two-car garage. The three homes in the Ranch Collection are between 2,161 and 2,644 square feet in size. These include two bedrooms, a den, two-and-a-half or three-and-a-half bathrooms, and a three-car garage. The largest homes are offered in the Sky Collection. These three models have three bedrooms, three-and-a-half bathrooms, and a three-car garage. 55places.com is not affiliated with the developer(s) or homeowners association of Trilogy® at Wickenburg Ranch. The information you submit is distributed to a 55places.com Partner Agent, who is a licensed real estate agent. The information regarding Trilogy® at Wickenburg Ranch has not been verified or approved by the developer or homeowners association. Please verify all information prior to purchasing. 55places.com is not responsible for any errors regarding the information displayed on this website.